According to management guru Peter Drucker, one of the greatest traits a business leader can have is intellectual honesty. This is the ability to see the world as it is and not as you want it to be and then to act accordingly. This applies equally as well to great investors like Warren Buffett and Charlie Munger. They have built an incredibly rational business model that allows them to act with intellectual honesty. Intellectual honesty first starts with deep curiosity to try to ascertain cause and effect in all aspects of life, not just business. This curiosity, combined with putting ideas into action and gaining experience, allows one to have a sensitive antenna to pick up signals for opportunities and risks. The ultimate goal is ignorance removal in order to avoid errors of optimism (going all in at the top) and errors of pessimism (missing opportunities at the bottom). It also helps you stay the course and not be shaken out by normal volatility when you have confidence in the long-term growth potential. The result is that losses are minimized and great gains can be garnered. This has enabled Berkshire Hathaway to produce extraordinary rates of return for over 50 years and create extraordinary wealth for Buffett, Munger (to a much lesser extent than Buffett), and for those shareholders that have owned the stock for a long period of time. 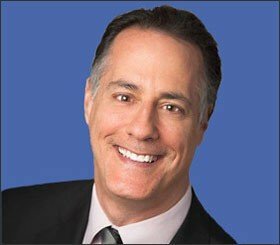 Now it’s one thing to avoid landmines and capitalize on opportunities in the world of investing and it’s another when the consequences can be much more severe, such as losing your life. I know that sounds very dramatic but in the case of Peter Drucker, his intellectual honesty truly did save his life. Or, to be more precise, he observed the great benefits of being intellectually honest and then made a concerted effort to live his life that way and this ended up saving his life. According to a profile of Drucker in Forbes in 1997, Drucker didn’t just write about intellectual honesty, he lived it in the most profound way one could have at the time. We turned the talk to Europe, where Drucker was born, educated and lived until he was 28. He left in 1937 because, unlike many other European intellectuals, he took Hitler at his word. (“I read Mein Kampf,” he says.) Another example of his clear-sightedness, his “intellectual integrity.” While others let wishful thinking lull them into a security that ended in concentration camps, Drucker saw what he saw and acted upon it. The first step is to put oneself in a position to be made aware of impending threats and then assess the probability and severity of them. If there is a meaningful chance that these threats could impact oneself, then it is a must to take countervailing action unless you are prepared to accept the consequences. Unfortunately, millions of others didn’t see the world as clearly as Drucker did in the 1930s and act accordingly. Doing nothing was overwhelmingly the non-action action. Joseph Stalin supposedly said something to the effect that one death is a tragedy, a million deaths is a statistic. For someone who is Jewish, it is particularly inconceivable to comprehend 6 million of your people being exterminated, the vast majority of whom were killed in a three year period by the Nazis. 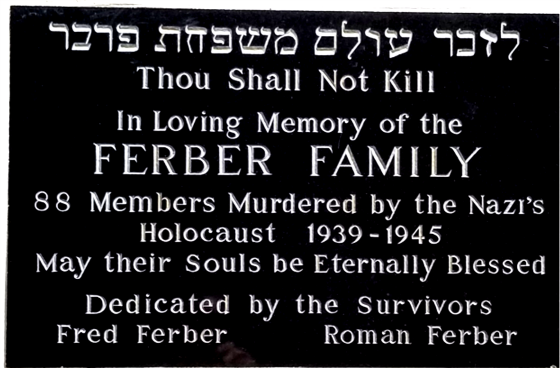 Imagine being the Ferber family and finding some way to come to terms with 88 members of your family being killed for no other reason than they were Jewish. 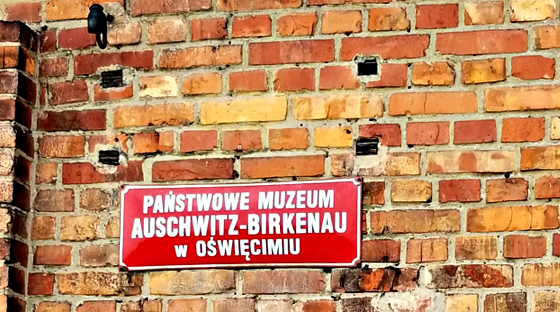 My wife and I spent a week in Poland visiting Warsaw and Krakow to see with our own eyes where the worst atrocities ever carried out by man took place. While there is no sugar coating what will follow I am happy to say that it ends on an optimistic note. The first act the Nazis carried out was to segregate the Jews into ghettos to have them confined in one place where they could be controlled, stripped of their material possessions, humiliated, and have their dignity taken from them. This was the first step towards the “Final Solution” which aligned on using some Jews for slave labor to help with the war effort and to murder the rest. 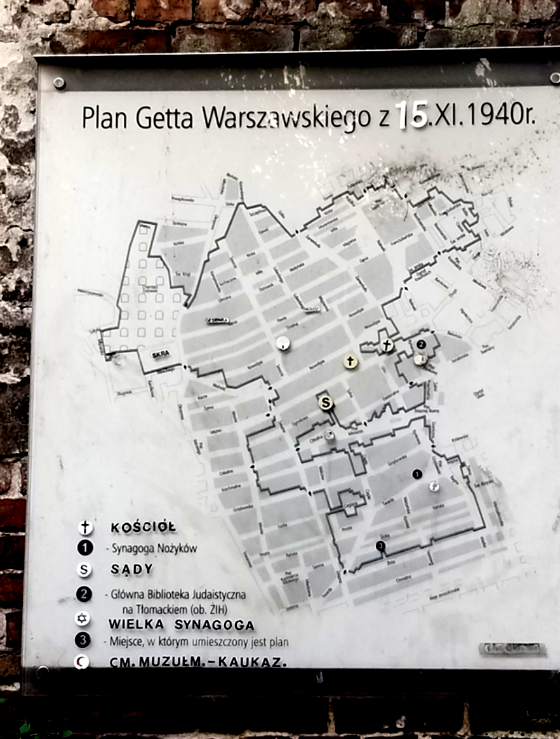 This is a map of the Warsaw Ghetto which required the city’s 400,000+ Jews to forcibly be moved there. They were imprisoned in an area of 1.3 square miles resulting in an average of 7.2 people to a room. It is estimated that less than 5% survived. This placard shows the disdain felt by the Poles and the Jewish community for the world’s inaction towards what was happening in Poland. 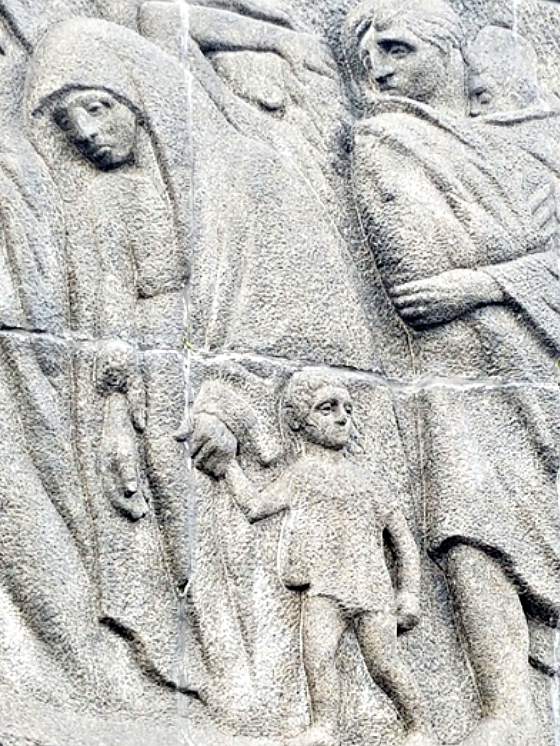 This is a sculpture at the Polin Museum in Warsaw dedicated after the war and it poignantly shows the Jews being led on a death march. This close up shows the innocence of the child looking out at the world with his two eyes and seemingly wondering why no one is helping while the adults can no longer make eye contact with a world that either doesn’t care or is too afraid to do anything to help. 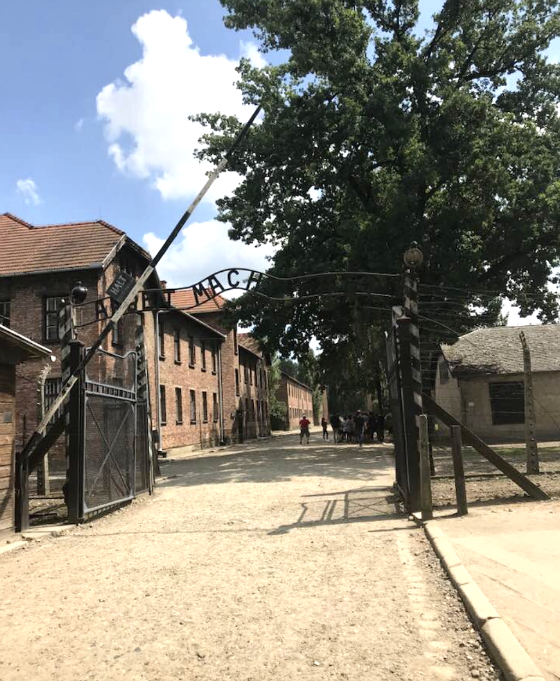 From Warsaw, we headed to Krakow to visit the two most heinous places the world has ever known: the death camps of Auschwitz and Birkenau. 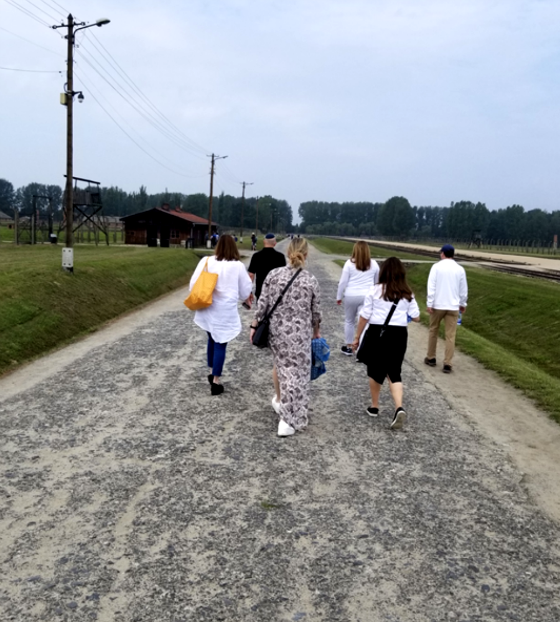 We went to Birkenau first, also known as Auschwitz II. It’s chilling to see the train tracks going right into the camp and the very long entry road. The camp is enormous as it held 90,000 people. This is the famous entrance to Auschwitz where it says “Work Sets You Free“. I think these next two pictures speak for themselves. After the Nazis evacuated the camp as the Russians were closing in, they left behind a number of items. Fortunately, photographs were some of those items and they were found by one of the prisoners. 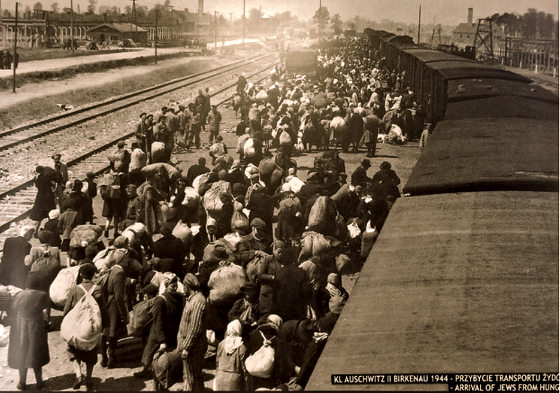 This shows Hungarian prisoners coming to the camp in 1944 and getting off the trains. They could take one suitcase with them. Most of them are wearing their winter coats in May which tells us that most people did not expect to be going to their deaths (70% to 75% on the same day of their arrival) as they would not be bringing their winter coats with them if they did. In addition, they brought these coats so they could carry more possessions. Upon arrival, their suitcases were immediately taken from them and everything was removed, sorted, and stored in warehouses. Pictures to follow. 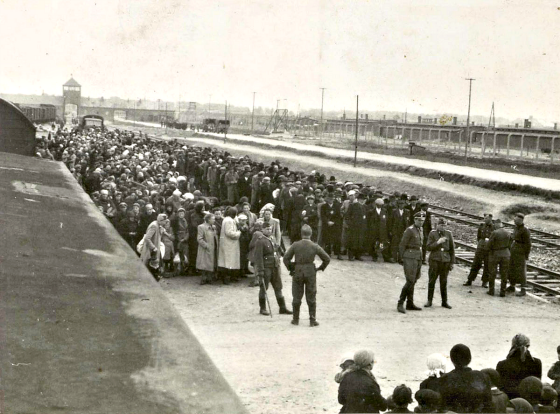 Here is German efficiency at work as they convert the unorganized mass of people into two well-organized lines. Here is a close up of some of the people. I find the interlocked hands to be particularly poignant between mother and son. If you were a child under 14, only 65 out of 200,000 survived. Your fate was instantly sealed by the Gestapo camp doctor who would look a new arrival over quickly and immediately point left or right. 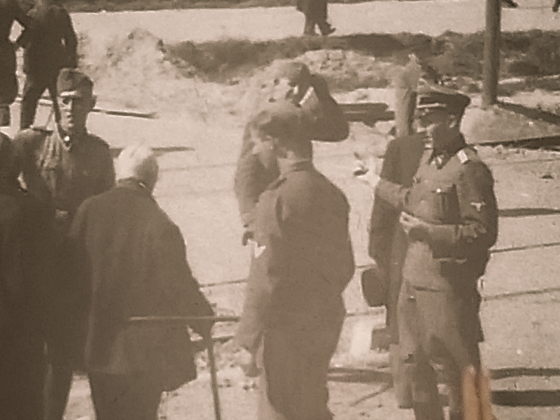 If he pointed right, like he is doing in this picture with the old man, then you were headed to the gas chamber. 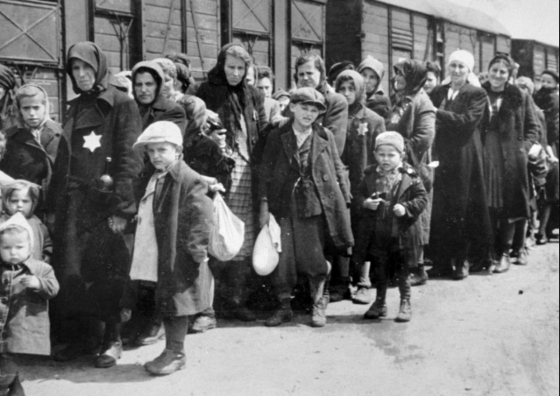 Jews were not the only ones murdered in the death camps but they were the only ones gassed. 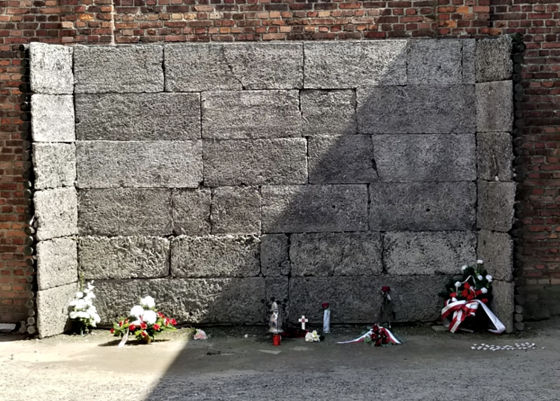 Below is a picture of the wall where non-Jewish Poles were forced to line up and then they were shot to death. For those not immediately killed and put to work as slave labor, they had their pictures taken as well as their date of birth, their date of deportation to the camp, and when they died. The average prisoner who wasn’t killed immediately died within three months. 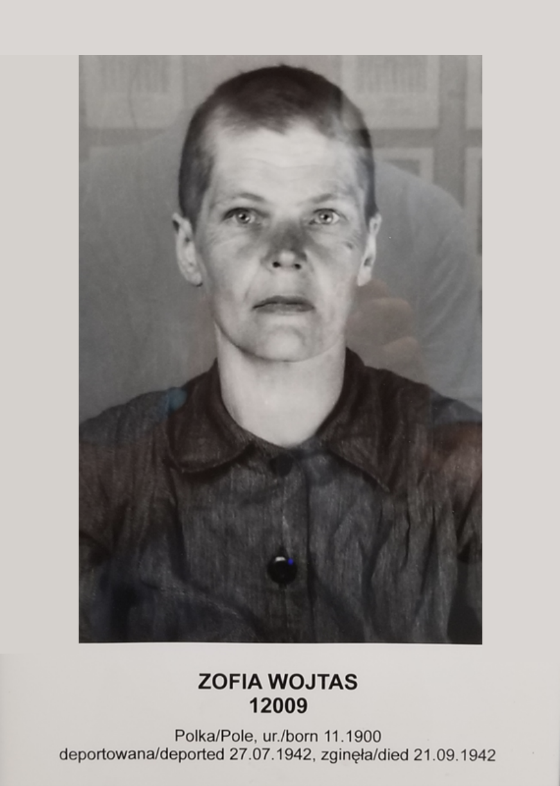 I took this picture because this woman was deported to Auschwitz exactly 76 years to the day of our visit. She died a little under two months later. Notice how her head was shaved. They shaved the heads of all prisoners to strip them of their gender and dignity. They wanted to strip every person of their individual identity. The next two pictures show some of the materials gathered from the Jews deported to the two camps. 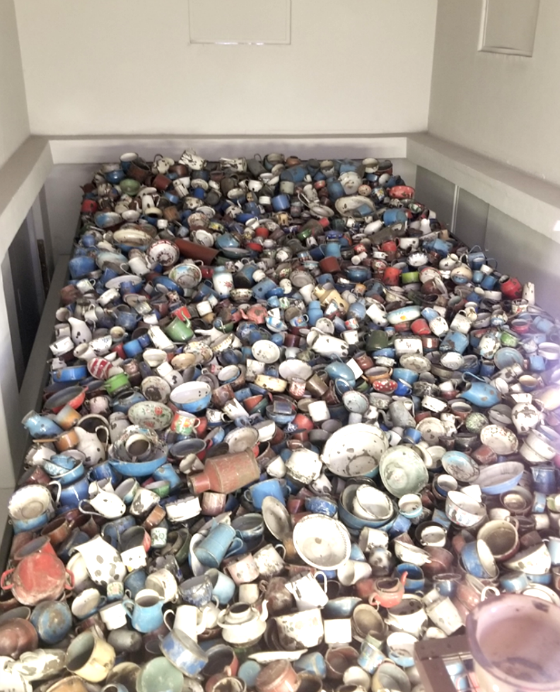 The first one shows some of the pots that were confiscated while the second is a collection of suitcases many of which have the names on them. My wife’s grandfather was one of 12 brothers from what used to be Poland but now is the Ukraine. Nine of them were killed in the Holocaust. He left Poland at 18 because he was a Zionist and wanted to live in what was then Palestine. 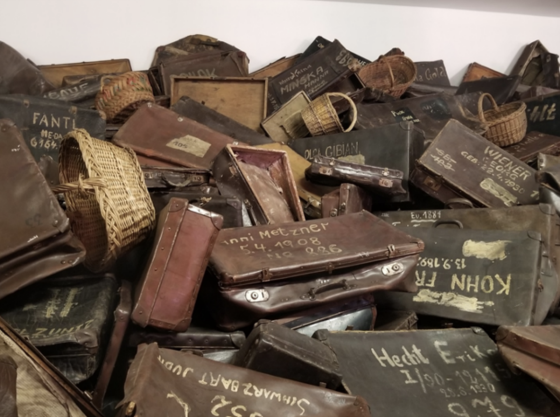 At the end of the tour, there is a room we visited with numerous books comprised of countless pages with the names of 4 million of the 6 million Jews killed during the Holocaust. I told my wife that we needed to look for her grandfather’s family. Her maiden name is Kimeldorf. We hurriedly leafed through the books to find “Kim” as we did not have a lot of time since we were with a group touring Auschwitz. Lo and behold we hit pay dirt and this is what we found. It’s one thing to have heard about ancestors that were killed in the Holocaust and it’s another to see them all there in black in white along with the rest of the 4 million. Roneet and I were both profoundly moved by seeing this and it took a number of days to actually process what we had seen. We sent this picture to my father-in-law and he was able to confirm that where most of the people are from is where his father’s family lived and he recognized many of the names from stories his father told him. I said that I would end this on an optimistic note. 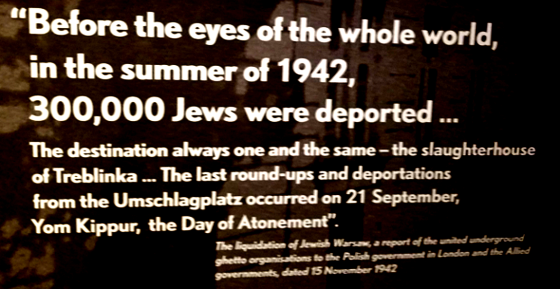 I can only imagine what I would do in a situation like what the Poles were faced with under Nazi occupation in which helping Jews and sheltering them was punishable by death for not only the one who made the decision but for his or her family members as well. And yet there were many people who put their lives and the lives of their family in great peril by doing just that. 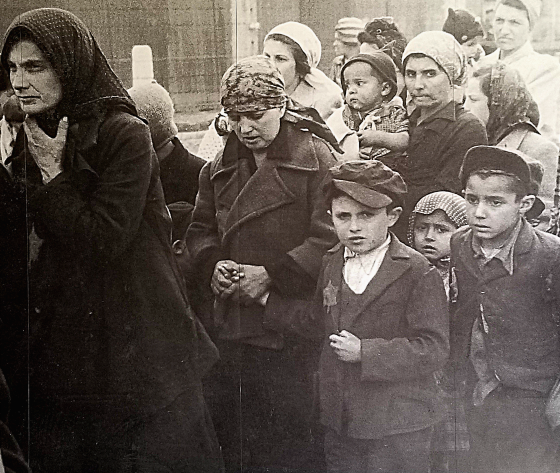 Yad Vashem, which is the Holocaust museum and memorial in Israel and the center of Holocaust research, has awarded over 26,000 individuals the designation of “Righteous Gentiles” for having saved Jews during World War II. The most famous one is Oskar Schindler, who was memorialized by Steven Spielberg’s extraordinary movie called Schindler’s List. 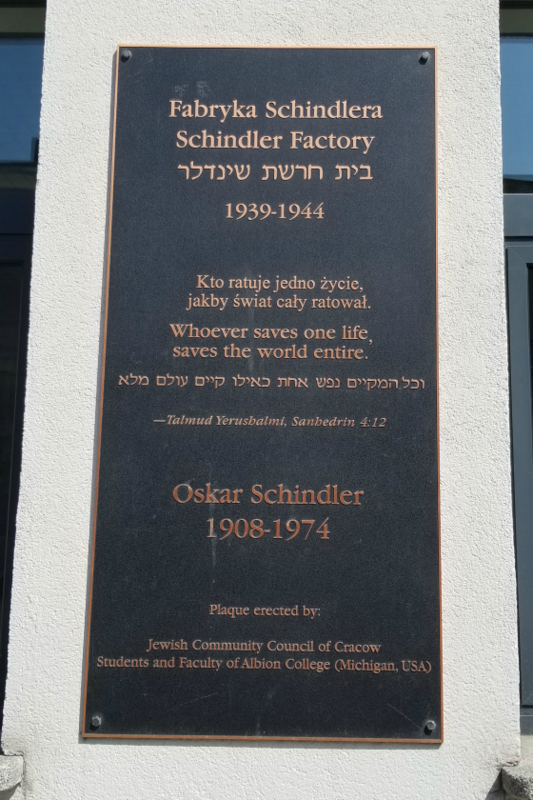 We went to his factory in Krakow where he was able to employ and ultimately save over 1,000 Jews. Here are photos of some of the “Schindler Jews”. Since I’m in the apartment business I had to photograph the apartment building in which Schindler lived in Krakow. It’s the second building on the left. We had the extraordinary good fortune to meet with one of the “Righteous Gentiles” whose family helped save a 14-year-old girl by hiding her and convincing the local priest to give her false baptism papers. She is 91 today and the woman she and her mother saved is still alive and lives in Israel and they remain very friendly to this day. She was able to visit her in Israel a number of years ago and it was one of the highlights of her life. She does not consider herself a hero. 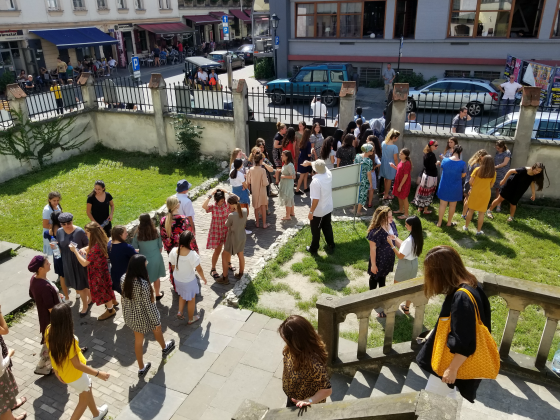 One of my most fascinating realizations and something that gives me a glimmer of hope is the extraordinary rebirth that is just beginning to happen in Krakow of Jewish life. This is happening as many Poles begin to learn from family members that they have Jewish roots and they want to learn more about Judaism. Some have gone as far as starting the process of converting, while far more are putting a toe in the water by involving themselves in community type events. Many others are observing from afar and not taking action at this point. Equally interesting and exciting is that there are a number of Poles who cannot accept that a huge part of their history has been wiped out by the Nazis. Jews have been in Poland for over 1,000 years and made a huge impact on the culture and they believe it is vitally important to study this history and do what they can to help revive Jewish culture and life in Krakow (as well as other cities in Poland). By doing this they believe they can help do their small part to heal the past and to make Polish culture more vibrant and inclusive. The next picture shows the very impressive Jewish Community Center in Krakow that is run by a very dynamic American who grew up in New York. It has an annual budget of $1.5 million of which 95% comes from foreign donors, mostly from the United States. We had Friday night dinner there with probably 75 people. It is obviously a lot of work to make this happen. What I found fascinating and so amazing was that all 55 volunteers to pull off this dinner, and every Friday night dinner, are Polish non-Jews. They have no interest in converting but they do have a deep interest in helping to revive Judaism in Poland because it was unnaturally removed to what they feel is the great detriment of Poland. It is truly a symbiotic relationship built on great respect and admiration between the embryonic Jewish community and non-Jewish, deeply committed volunteers. 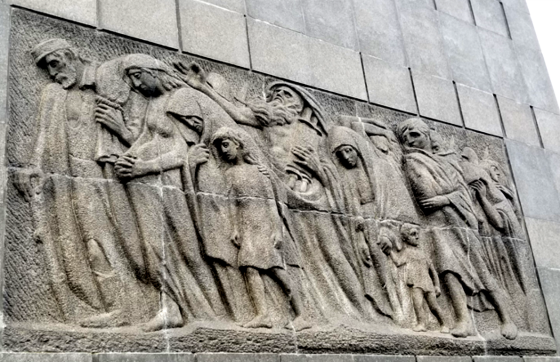 The center is trying to change the narrative of Poland and the Jews from one of death and destruction to a quiet revival of Jewish life in Poland. 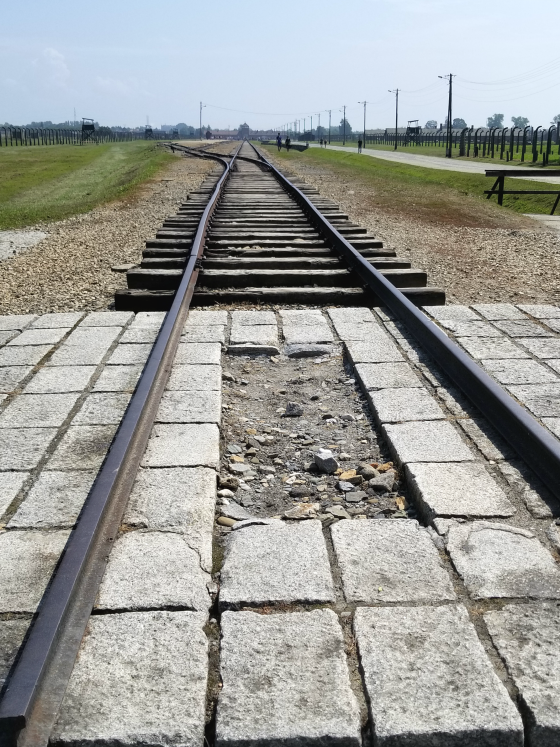 One of the ways they are doing this is by organizing an annual 55-mile bike ride from Auschwitz to the Jewish Community Center that they call the “The Ride for Life”. Last year it raised $350,000 and the great cyclist Greg LeMond rode in it and he said he is coming back next year with his three children to do the ride he was so moved by it. To show how far things have come for Jewish life in Krakow, the city holds an annual Jewish Culture Festival that attracts over 30,000 attendees, the vast majority of whom are not Jewish. This is a synagogue we visited and as we were leaving a large contingent of Israeli children seemingly came out of nowhere who were visiting the temple as well. Oh and to completely change the subject before ending with some powerful words by someone we met in Warsaw, the heavy metal band Iron Maiden was playing two sold-out shows at the 15,000 seat arena in Krakow while we were there. 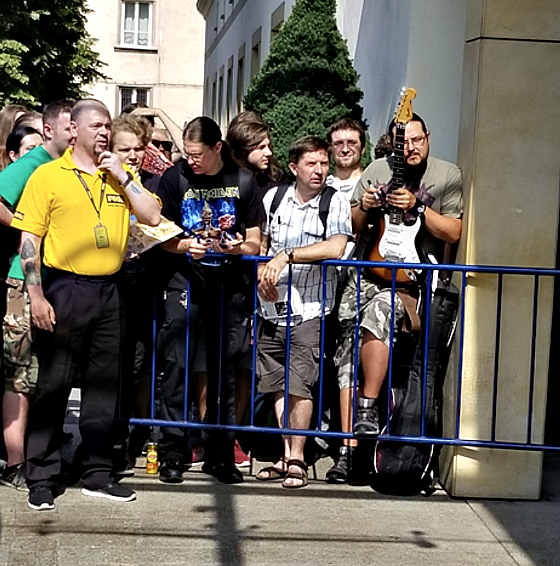 They were also staying at our hotel and here are some of their fans waiting to get a glimpse of them and maybe get some autographs as well. I want to end with a touching email that one of the individuals in our group received the next day after she and another individual joined us for dinner to speak about some of the concerning trends in Poland that have been bringing anti-Semitism out of the woodwork. She and the other gentleman who joined us for dinner are attorneys working pro bono to use the legal system to fight anti-Semitism. They are doing courageous work in many ways. She has also discovered she has some Jewish roots and has turned to Judaism more and more over the last few years to the point that she wears a Star of David in public, which is highly unusual in Poland. I wanted to share what she had to say as I thought it was quite poignant and paradoxically, quite optimistic from my perspective, as I truly believe that Poland has a huge opportunity to move forward by facing its difficult past and trying to understand why a group of people that had been in Poland for over 1,000 years had been, for all intents and purposes, wiped out and what was lost from their elimination from the culture and society. For the very empathic and sensitive souls, the ghosts of the Holocaust from Warsaw and Krakow and other Polish cities and towns speak to them as they clearly do to this individual as she so eloquently communicates. I have made some slight edits for readability and since I did not seek her permission to reprint this she will remain anonymous. I thought I will just add something to what my colleague said about fighting anti-Semitism and involving in legal actions (and other actions) against anti-Semitism in Poland as a form of feeling better and “doing it for ourselves”. It is perhaps true that we engage in “saving the world” for egoistic reasons mostly. However, in my case, I know that I also do it because I believe in certain values and ideas, but also because I carry within myself a lot of “Jewish sorrow”, as a friend of mine, Professor Alvin Rosenfeld from Indiana University once told me. I feel this pain, combined with a great sense of responsibility – and guilt, so strongly denied by the large part of the Polish society. 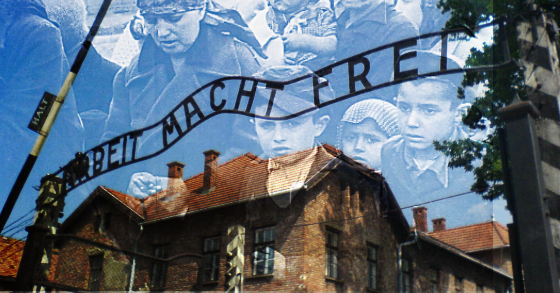 When I was a very young girl, still a student, I used to go to Auschwitz every month. I know it sounds weird but this was a place where I found a kind of peace of mind – I can’t really explain this. I felt close to the pain and sorrow of my people, even though, as I told you yesterday, I have been separated from the culture, language, religion, and my Jewish roots. I guess I’m telling you all this to let you know that there are Poles here like myself who deeply know, feel and understand your emotions, emotions of the Jewish people and we will be here and do everything possible to fight the “oldest hatred”. 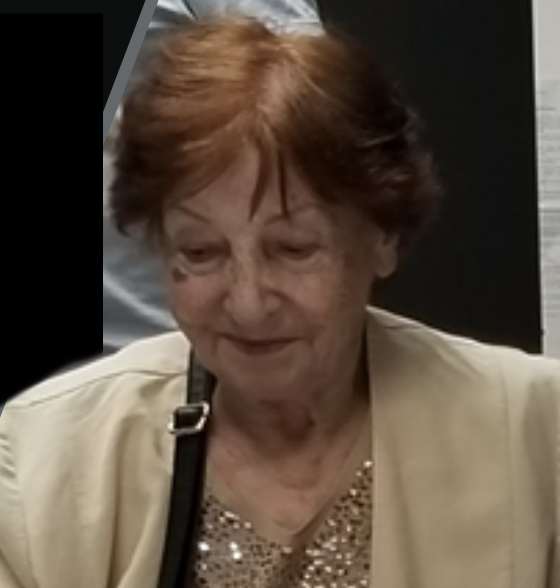 We are actually planning right now another litigation, as we were asked by a Holocaust survivor – an incredible person, a well-known writer living in Israel, Mrs. Halina Birenbaum, to take action in her name. We truly hope we will be able to proceed with this case, as we find it crucially important not to let Holocaust survivors feel insulted and hurt in the country where all her loved ones perished. We will be also representing a distinguished Holocaust history scholar attacked in Poland for his academic books on the role of Poles in the Holocaust. Hope to stay in touch and wishing you all best. We were so impacted by the trip that we hope to return next year with our kids. It was truly life changing in so many ways. 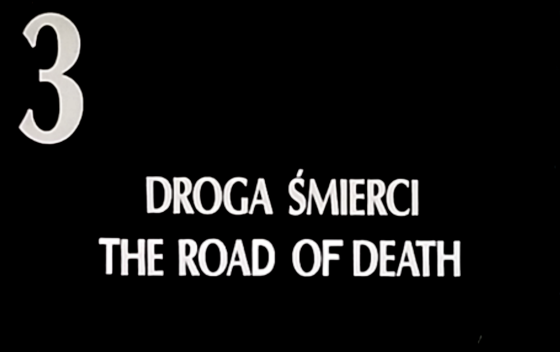 I hope one day to also ride in the Ride for Life. Having a big goal like that is inspiring to me. It will force me to get in shape so that I can successfully complete it, I love the cause, and I can only imagine how satisfying it would be to complete the journey and have the opportunity to meet a wide array of interesting and committed people. And in the spirit of intellectual honesty, I can’t end without making a real estate comment. 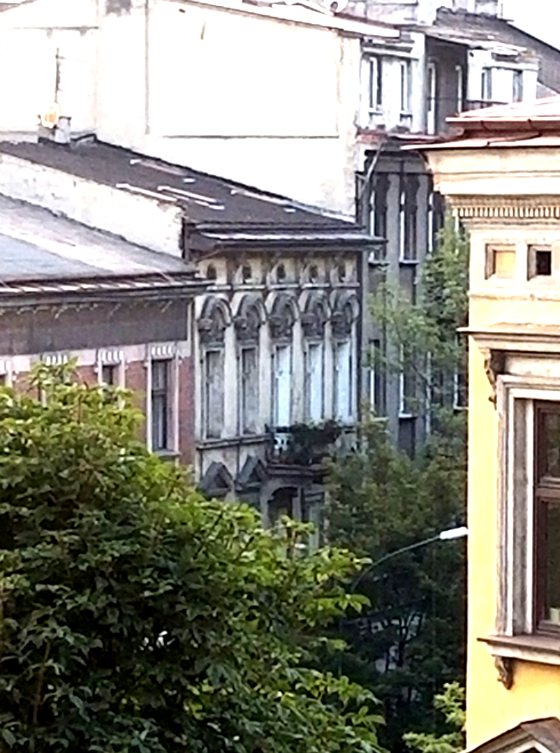 I think that Krakow could be a very compelling place to invest in real estate, particularly if the revival of the Jewish community there takes hold and begins to grow in prosper. This will have great multiplier effects. For the adventurous investor, it might be an interesting place to research. Your article brought me to tears. Thank you for sharing. I could not read ALL of your blog, just too painful all at once. Certainly those times are all too similar to our own. Separation of families, the refugees desperate to find a safe place, oppressive authority and demagogues. Very moving, well written. I appreciate you sharing your travel to Poland and historical sights with the C.W.S. family. Like your wife’s grandfather, my grandfather was from Poland, Vialystok. Many of his family did not survive the Holocaust. My cousin visited his home town recently and was not impressed with the Polish peoples response to memorializing the local Jewish community history. My grandfather retold to us the terrible anti-Semitism he faced as a young boy before he immigrated to the U.S. at 15 in 1908. 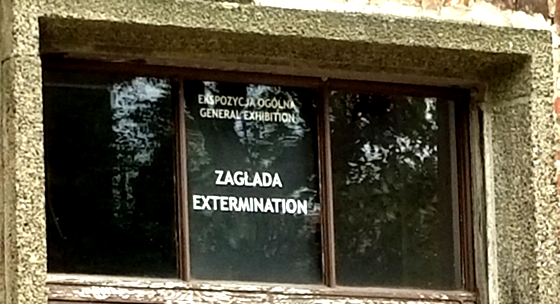 Its nice to know that some Polish people are trying to correct the wrongs of the past.